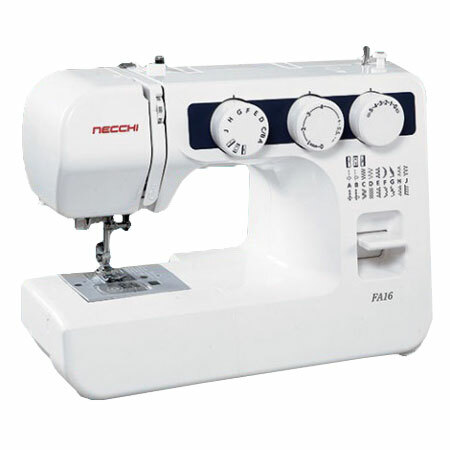 The Necchi FA16 makes the perfect sewing machine for the beginner. At only twelve pounds, whether you are sewing projects at home or taking the machine with you to classes this light weight machine offers lots of great features that will make your sewing time more fun. The handle makes the machine easy to carry and folds out of the way when not needed. The dials on the front of the machine allow you to choose from 16 built-in stitches and a four-step buttonhole. The built-in needle threader makes threading the needle a snap. The FA16 also has a top-loading bobbin system and Auto-declutch bobbin winding. The free arm lets you tackle the hems of pants and shirt cuffs with ease. The LED light brightens the sewing area so you can more easily see what you sewing. The Instruction Book is illustrated and easy to read. This Necchi FA16 includes a FREE 1/4" foot. This is not packed with the machine by Necchi. We are offering it as a promotion.